Product Detail-Ingredients-Yeasts, Minerals, Molluscs and Crustaceans, various Sugars, Milk and Milk derivatives. Nutritional Analysis-Vitamins A, D3, E, B1, B2, B6, B12, Pantothenic Acid, Nicotinamide, Biotin and Carnitine. 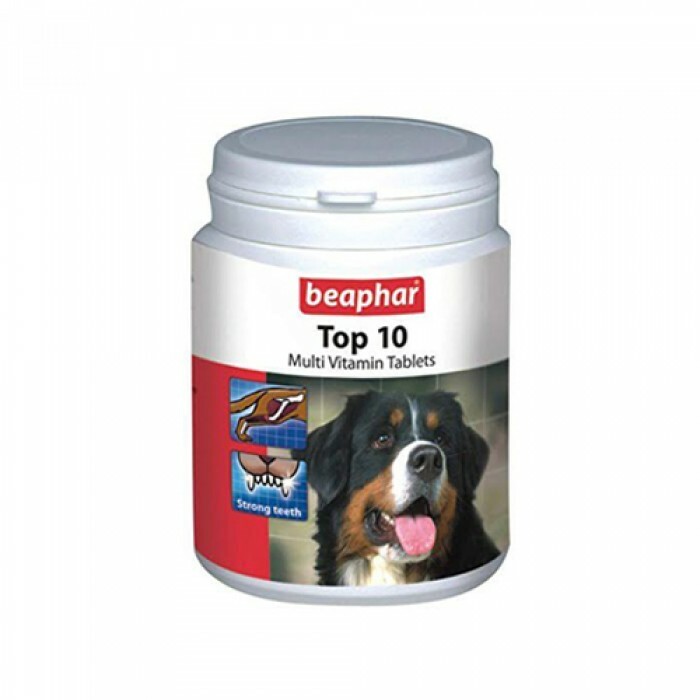 Use- Highly palatable multivitamin-mineral supplement for dogs and cats. Suitable-Dogs. Quantity-160 tablets. 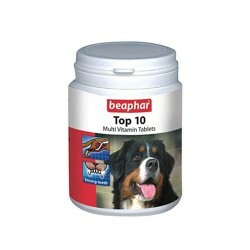 Product Information -Top 10 is a food supplement for dogs. It contains essential vitamins, minerals and trace elements which promote vitality and strengthen a dog?s physical condition. Top 10 encourages the natural development of bones and teeth of young dogs and ensures a glossy coat and bright eyes. In older dogs Top 10 helps to keep pets lively and agile. It also contains L-carnitine for strong muscles. Features -Vitamins and minerals, Healthy growth, Strengthen bones, Maintains eyesight, Strong musculoskeletal system, High energy.